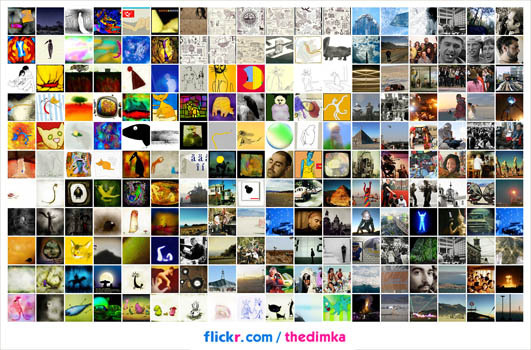 flickr is relatively new (a bit more than 3 years), and was bought by yahoo and it is mostly a good thing, and it is growing and tons of very interesting talented creative people are there. Of course there are crowds of folks who just uploads hundreds of ever boring party and vacation photos, but if you sniff around you can find a gold mine with artists, illustrators and creative photographers! for those who mostly enjoy looking at images in their friends livejournal entries it will be pure fun. i could not bypath such phenomena and little by little got my stuff uploaded and now it's virtually all there. I still consider that LJ is way better as a site (comparatively, especially in usability and features, and i tried many, blogspot, and facebook and virb and devianart and myspace and high5 and mail.ru and li.ru and wordpress and moveabletype and twitter to name a few) and more useful and it is very important, but never the less, the people and community is essential and flickr got them (those who i like finding), plenty of them.